Wales is gaining an international reputation for its innovative health and social policies around prevention and well-being with their focus on what matters most to people and relational, compassionate, innovative and joined-up ways of working. Together, we will explore evaluation, research and development that nurtures and supports a truly caring society. 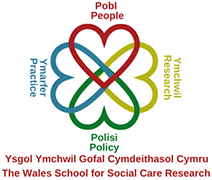 Drawing upon practices taking place in England, Scotland, Wales and the Netherlands, this conference will bring together representatives from across the four overlapping hearts of the Wales School for Social Care Research, i.e. people, policy, practice and research.